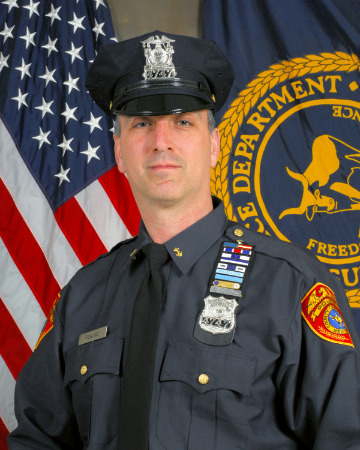 When Second Precinct Police Officer Matthew Funaro responded a call of a house fire in Eatons Neck yesterday afternoon, he said he saw flames and smoke billowing from the second floor of the 120 Old Winkle Point Road home. From his vantage point at the top of the bluff, he rushed down the zig-zagging stairs and approached the back of the house where he entered through the sliding door. Once inside, he found 88-year-old Helen Morris in her medical bed in the living room. Funaro realized that he had to get her out of the house immediately, and determined that her wheelchair would be the best way to get her to safety. With help from Joseph Cartelli, repairman who was working at the home, the officer lifted Morris into her wheelchair and rushed her outside. Realizing that Morris wasn’t dressed for the intense cold, the pair then piled blankets on top of her to keep her warm. “It all got done by teamwork,” Funaro, 45, said. Cartelli said Thursday that he was at the home because he responded to a call from Morris, who said that there was a heating problem. As he inspected the bedroom on the second floor, he said he noticed a haze in the room, but thought it was coming from the fireplace. He said he went downstairs and noticed the lights were flickering and suspected something was amiss. When he went back upstairs, he noticed more smoke. “The center of the bed was engulfed in flames,” Cartelli, 56, said. Cartelli said he and Morris’ son frantically ran up and down the stairs, using pots of water to try to put out the fire, but it just wasn’t enough. He feared for Morris’ safety since her medical bed was directly underneath the second-floor fire, he said. After Morris was evacuated, both Eaton’s Neck and Northport fire departments arrived on scene to extinguish the flames. Morris was transported to Huntington Hospital for treatment of non-life-threatening injuries, including cuts and bruises, police said. “Everyone was prompt on getting there, everybody was quick,” Cartelli, of Kings Park, said. He believes the fire was electrical in nature, but police said Arson Section detectives are investigating.